Effective communication is integral for every company, regardless of the industry. Contrary to popular thinking, email is still one of the most powerful means of communication. All companies; from small business to medium-sized companies to large enterprises, make extensive use of the email. As a company grows, so does its need for an effective email system. What if you could send an email to multiple leads, contacts or accounts? With Flexie, you can do this and much more. But before we explain how can you use sent bulk emails to records from the grid view, let’s briefly explain what’s mass emailing. As the name itself denotes, mass emailing is a powerful feature that allows you to send an email to multiple records you may have in Flexie CRM. Records can be leads, contacts, accounts, cases and custom entities. So, instead of sending an email to one record at a time, manually, you send it automatically to a group of records. To illustrate mass emailing records from the grid view, let’s say you want to send an email to a lead list. First, go to Leads and in the drop-down menu select Manage Leads. Consider this scenario: you want to send an email to all leads. Going to each specific lead and manually sending the email would be a waste of time. That’s where Flexie’s CRM mass email comes into play. You may have different lead lists, so you have to choose the list you want to to send your email to. To do this, go and click the Select list. On the drop-down menu, choose the lead list you want to send your email to.Once you choose your list, you can either selected the leads of that list you want to send your email to, or you can tick the box right next to the total number of leads for that list. 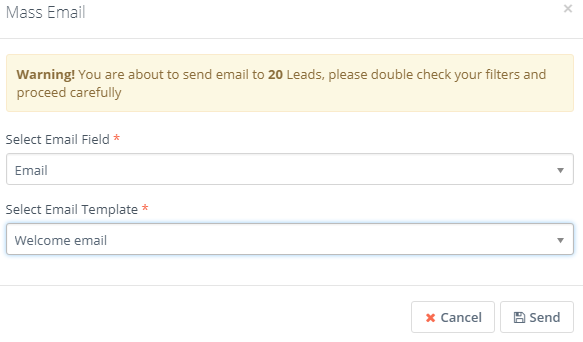 If you tick that box, the email will be sent to each and every leads within that list- no matter the number. Let’s suppose you want to send the email to all leads within your selected list. 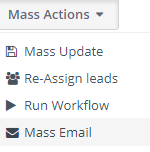 Once you tick the button right next to the number of leads within the selected list, your next step is to go and click the Mass Actions button. On the drop-down menu, go and click Mass Email. Notice the warning at the top of the form. This is very important because it not only shows you the number of leads which will receive the email(provided that each leas HAS a valid email address), but it also invites you to be careful when selecting filters. Next, select the email field and then choose the email template you want to send to the selected lead list.Before sending the email, ensure that you have chosen the right email field and email template. To send the email to your selected lead list, just click the Send button. You will immediately receive a notification that the message has been sent. This was an example for sending mass email to a lead list, but you can do this for other records such as contact, accounts, cases and custom fields, right from the grid.